Diamonds Chicago is located on Jewelers Row in Chicago. 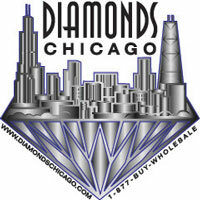 Diamonds Chicago will help you find Jewelers Row Chicago and the Chicago Jewelry mall. It is often hard to find exactly what you are looking for online. For your shopping convenience, Diamonds Chicago has provided this site map of our Website. Hopefully this will help you navigate our site more efficiently. Should you have any problems finding what you are looking for just call us we will be more than happy to assist you. Only a small percentage of our inventory is pictured online. Most chances are that we do have what you are looking for at our location in The Jewelers Center Building on Jewelers Row in Chicago. Above, Please find a Map to Jewelers Row in Chicago. Diamonds Chicago is located in the Main Jewelers Building called the Jewelers Center Building or "The Mallsers Building". Of course there are jewelers all up and down wabash on Jewelers Row Chicago but The Jewelers Center is the main Jewelers Building. Once you get to the Jewelers Ceneter Building, we are on the 13th Floor right across from the elevators.